Apparently, the final remnants of Boston's snowfall from this past winter has finally melted as of yesterday (7/13/15). See progression video in the above-link. Dammit. That's the last time I buy an August Ski Pass from someone in the subway. People seriously have personal boilers and steam heat in their house? Not steam, but hot water. Richard Trethewey of This Old House prefers it to forced air, because it's more constant. (Of course he's from New England too, and boilers work well with fuel oil.) Forced air has that brief time when the fan turns on and it blows cooled air out of the ducts until the warm air starts coming out. My parent's house is very rare (I've not seen another outside those built as the same thing) in that it has a hot air vent system (working by convection, rather than pumped via fans), rather than the near universal in the UK (for domestic buildings) hot water/steam fed radiator system. It warms up as quickly as other houses. It does look better without the large metal radiators on walls (which get hot, unlike the airvents), but if there's an issue with the boiler (hot water, and the hot air), it's hard to get someone to fix it as it is so rare. I'm trying to work out how you could have hot running water without a boiler (gas or electric) in the house (sure, an apartment block can share). While electric showers heat the water there, that doesn't help with sinks and baths. Obviously there's Icelandic solutions of warm 'waste' water from geothermal power stations being piped straight into people's houses. In American houses that have forced-air heating, the norm is to provide a separate hot water heater that can be either electrically powered or gas-fired. It is insulated to limit heat loss, and hot water pipes are also lagged, especially in recently built houses oriented toward thermal efficiency. The typical lifetime is about seven years. Electric showers are almost unknown in the US. Hot water heaters are usually plumbed to supply everything that uses hot water, including not just showers, baths, and sinks but also dishwashers and clothes washers. If you read American genre fiction, you occasionally see indirect references to hot water heaters, e.g. in noir crime novels where the protagonist has been out among the sleazebuckets and is so repulsed by the experience that he or she showers until the "tank is empty" (hot water heaters have a finite tank capacity and once this is exhausted, it takes time to heat a fresh load of water to the hot-water supply temperature, which is usually 140° F since this is considered the minimum to allow dishwashers to sanitize dishes properly). Most people also try to schedule their showers not to coincide with hot loads of laundry in the washer. However, there are also tankless hot water heaters (electricity or natural gas) that heat the water moving through them "on demand". One of the major advantages of forced-air heating is the reuse of the exact same vent system for A/C. Most dishwashers now incorporate an electric heater, so you can set the hot water heater to about 110 F to be more efficient and not scald a child or elderly person who accidentally turns the water on hot all the way. Tankless tend to be significantly more expensive, rarely installed unless the existing unit kicks and the homeowner already has to replace. The long-term savings favor smaller households that otherwise waste a lot of electricity/gas heating unused water. Does anyone here use a heat exchanger? Folks I know who have built super-insulated (very air-tight) homes use them for fresh air flow, but I know little about how they work in practice. I don't have one and don't know anyone who has. However, I have heard of heat pumps being used as part of energy-efficiency retrofits in Britain and apparently one of the more important considerations is to have a yard ("garden") large enough that the pump won't turn it into a thermokarst. The reduction in air exchange rate is one of the few concerns I have about Passivhaus standards and energy-efficient housing in general. A low rate not only means bad smells linger longer, but can also be a long-term health disaster if the house is built on radon-bearing rock. There is a relatively little incentive for owners of rental property to upgrade oil systems to gas, even in places already served by gas like you mentioned. The conversion rate is a little better in owner-occupied units, but gasfitters do not work cheap, and a modern efficient system can cost more than a few thousands to buy and install. *Forenote: I work with energy efficiency on a daily basis. This is my field of expertise. The trouble with boilers is that replacing them is expensive. So expensive that even if the boiler is an inefficient clunker, the cost of replacing it will outweigh any potential savings. If you compare full cost to full savings, the payback period on a boiler replacement is measured in decades, not years. For this reason, nobody ever replaces a boiler unless they have to, because their existing boiler is at the end of its useful life if not outright failed. This naturally makes conversion rates lag because natural gas has not been greatly cheaper than oil for that long compared to the average life of a boiler. That said, there are other considerations. A boiler burning oil can never be more than 85% or so thermally efficient because going above that would require dropping the exhaust temperature to the point where water vapor in it would condense before reaching the top of the stack, which given the SOx produced when burning oil is a problem since you'll get sulfuric acid and that will destroy your boiler real quick. With natural gas, however, you can design boilers to be 95% thermally efficient or higher, and this condensation is not a major problem because natural gas does not produce any significant amount of SOx when burned. A lot of rental properties in New York City have moved off of oil onto gas in the past five years or so since the city mandated that starting with the 2014 heating season, burning #6 fuel oil would become illegal. Any buildings that were using #6 oil were forced to convert by regulation, many decided to convert to natural gas rather than to #2 oil. As for heat exchangers, they are plenty common in large commercial properties and they are a great way of keeping heat in (or out, in the summer) while still meeting ventilation requirements. I have never seen one in a single family home, but then I don't work with single family homes so I can't speak to how common this may be. Meanwhile in terms of energy, yes, an air conditioner will likely move more than 3 units of heat energy for every unit of energy it consumes. A boiler, by thermodynamics, cannot create more than 1 unit of heat energy for every unit of energy it consumes. But, heat pumps can beat that since they move heat rather than creating it. If they were more commonplace, heating would require less energy. One, electric generation is usually quite inefficient - less than 50%, even. So figure that for every unit of electricity you consume, you are consuming at least two equivalent units of fuel - as opposed to one equivalent unit for burning the fuel in your home. Another is that, generally speaking, electrical infrastructure struggles to meet peak demand in the summer far more than gas/oil infrastructure struggles to meet peak demand in the winter. Supplying fuel in bulk is easier than supplying electrons in bulk, primarily because fuel can be stored in bulk and electricity really can't. Oil and gas production is largely constant and it is stored until it is needed. Electric production has to ramp up and down to match demand since it can't be stored. And last but not least, if you live in a climate which gets humid, that is going to have a major influence on air conditioning needs. The specific heat of water is four times the specific heat of dry air. So, in terms of energy required, average relative humidity is also a consideration, not just average temperature. One final bit of trivia I leave you with - for large buildings, there is typically a balance point at about 55 degrees outdoor air temperature where energy consumption is at a minimum, since this is the point at which an occupied building need neither be heated nor cooled. In a perfect, optimally energy efficient world, it would always be 55 degrees outside. A few years ago, my wife and I rented a flat in central London for a week. The heat came from the floor itself. It was really cool and not something I'd seen before. Is that common in the UK or something fancy that only rich Londoners would pay for? First of all, that was a very informative post useful for anyone who lives, well, anywhere. As for the paragraph quoted above, is it possible to achieve those higher efficiencies using powered exhaust to remove more condensation, or is that just not done on oil burners? Currently I only notice it on new gas burners. Regarding electric generation, don't forget that some of the electricity that gets "created" at a generating station is "lost" from the point where it gets sent out onto the transmission grid until it arrives at the customer premises for use. I have read estimates that range from as low as 6% to as high as 15%, depending on an assortment of factors that I am not qualified to discuss, except perhaps for distance - the longer the distance from the generator to the customer, the greater the loss (all else being equal). I'd like to give Duke87 my own thanks for sharing his HVAC expertise. That is underfloor heating. I have personally never seen it in the UK; my first experience with it was actually in a private home in Alaska. It is preferred for both comfort and efficiency since having the heat come from under the floor allows extremities such as the feet to be brought to a comfortable temperature with less input energy. However, it is rarely used because it is very difficult to retrofit into older buildings. In the UK its first use was actually in council houses (social housing) soon after World War II, and it acquired a bad reputation since the early systems were unreliable. Newer systems are much better but British homebuyers are still not likely to choose a house on the basis that it has that type of heating, because the general rule of thumb is to avoid buying newly built houses, which tend to have poor workmanship and cramped room sizes. So far nobody has mentioned regulation of interior humidity. In the houses I have lived in without forced-air heating (mainly in the UK; my experience includes one building with hot-water heating and another with storage heating, an abomination that still survives in Australia as well), there is no active control of interior humidity. However, this is necessary in buildings with forced-air heating because the air straight from the furnace is bone-dry and won't just dehydrate the inhabitants, leading to problems like chapped skin and dental caries, but will also cause buildups of static electricity in carpeted areas that make it very painful to touch metal objects like doorknobs. Years ago I spent a couple of nights in winter in a motel in Santa Fe that looked quite nice inside and out, but had no working humidifiers, and by the third day of very dry air I couldn't get out of there fast enough. I have experienced such heating in some rooms in the Nordic nations. It is somewhat common in bathrooms there, and sometimes in other rooms. Closer to home, I used to watch This Old House on PBS (it has become too commercialized for me, and I have lost interest), and the Concord barn project (originally aired way back in 1989) had in-floor radiant heating. In-floor heating seems most common in bathrooms and in the homes of people wealthy enough to do a This-Old-House-scale renovation. I agree somewhat about This Old House. My real issue is that they seem to address the home problems of those in a certain income bracket that can afford to support WBGH. There's less for the regular do-it-yourselfer than there once was. It still makes a lot of sense to watch it periodically if you're a homeowner. One episode can save you a lot of money if you learn the right trick. My parent's master bath has heated tile flooring, and it's been used maybe a handful of times since installation in 2005. I've never met anyone else with this feature. Worst part was how long it took to warm up. I can't blame people for not installing them. They are cool when you're demonstrating the features of your newly-remodeled house, but once the *wow*-factor has died down, it's not really all that useful unless you plan your shower an hour in advance. Yes, underfloor heating takes a long time to get going; this is another reason it hasn't been widely adopted. The house in Alaska I stayed in that had it had been built as a custom job by the then owner's son, who acted as his own construction manager and wrote his own HVAC specifications. The craftsmen and tradesmen on the show are still very talented. As for income brackets, I agree - they did one project house in Boston's Jamaica Plain that was deliberately and clearly geared to a homeowner of modest means, which was one of the best series of the Steve Thomas era. Random note - I took a course in transportation logistics from Ed Morash while he was at the University of Maryland. I believe Ed is a brother of Russ Morash, the father of This Old House. is it possible to achieve those higher efficiencies using powered exhaust to remove more condensation, or is that just not done on oil burners? Currently I only notice it on new gas burners. No. No matter how hard you force the air out, if the exhaust temperature is too low, you are going to have condensation before it exits. Which, with oil, will eat away at the stack itself, potentially creating interior leaks and thus a major safety hazard, even if it does not drip back down to the boiler itself. Those estimates are reasonable, and yes, distance is the most obvious reason. Weather will also have an impact, since the wires will have more resistance when they are hotter. Basically, some types of electrical equipment make electricity "foam" when supplied. 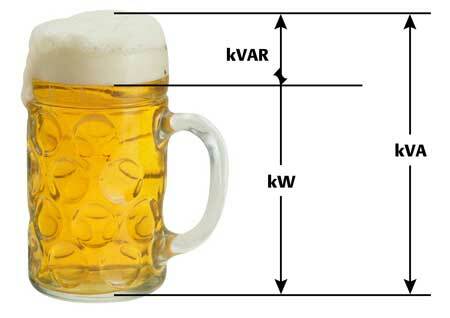 So while from the utility's perspective they have served you a pint of electricity, you have less than a pint that you can actually drink because of the foam. Bad power factor = more foam, less beer.